Actors Theatre is recognized locally and nationally as the leading arts organization in Louisville and is highly valued as a catalyst for creativity, innovation, inspiration and education in our community and field.  Focusing on outstanding quality in all of our work. Producing new plays and other productions throughout the season that attract national attention and are regularly produced by theatres in other cities. Engaging robust and diverse audiences in creating and understanding our work. Attracting the best artists, staff, board members and volunteers. Inspiring abundant resources to support our mission. 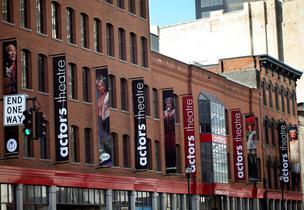 As the home of the Humana Festival of New American Plays, Actors Theatre of Louisville is world-renowned for developing new work by playwrights with varying styles, interests, opinions and innovative approaches to making plays. Actors Education shares this energy and passion for play making by venturing into classrooms and teaching the art and craft of playwriting in fun, collaborative and differentiated ways.